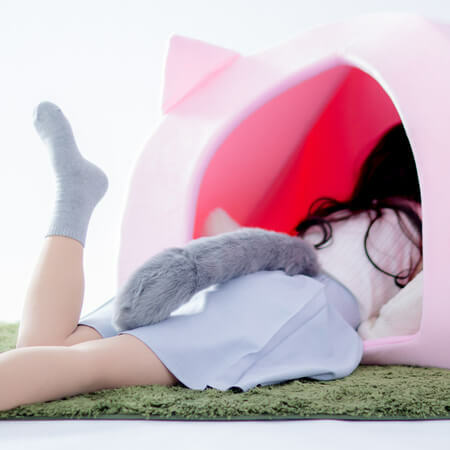 Idea goods brand Bibi Lab® have announced sales of a human-sized cat house so you can embrace your inner kitty! Bibi Lab’s policy is to faithfully adhere to developing products wanted by people, creating things such as sailor uniform style roomwear and wearable blankets for winter. They fulfil the hidden desires of the modern person. Riding the bandwagon of the cat boom that has developed in recent years, they have paid attention to people’s wish to become like cats. They put out a questionnaire to find out the reasons behind this. The questionnaire results showed that people were envious of the cat lifestyle and that they also desired to do things like bask in the sun and take an afternoon nap when they become tired in their everyday lives. It also identified people’s mentality in wanting to become cute no matter what. The questionnaire showed that 77.5% of the people who answered had experienced wanting to become a cat at some point. It also brought to life the fact that 10.4 people post on social media “I want to be a cat” (猫になりたい) every hour, which rose to approximately 250 people in one month. That’s where the human-sized pet house comes into play. The company suggested that if people have time to liberate from themselves and be a cat for a while, then the modern person today, who lives a busy and stressful life, can heal themselves. 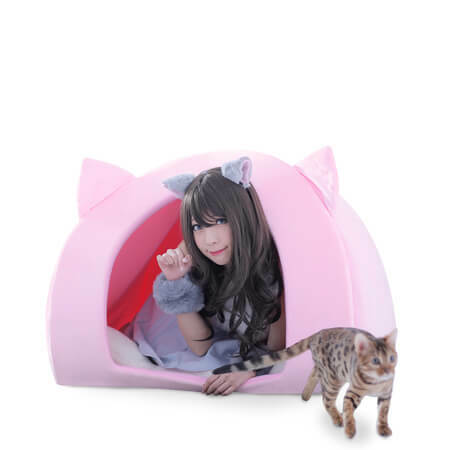 So they developed the pet house with cat lovers in mind and incorporated in every detail. Together with cooperation from companies that actually produce goods for pets, the resized human pet house is made just like a cat house would be made – everything from the materials to the shape and design. 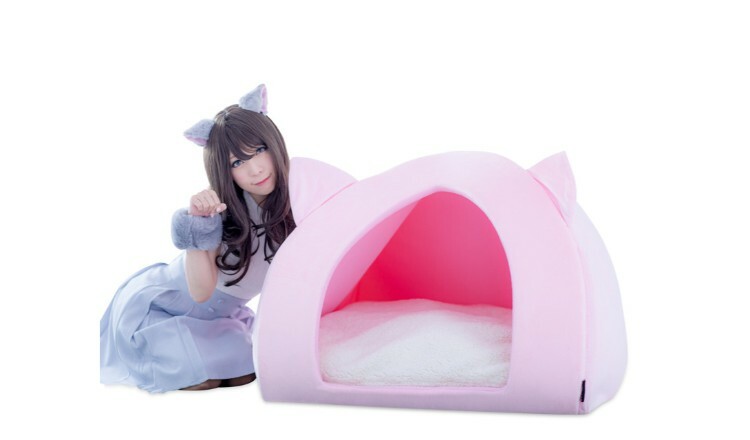 Based on the nature of cats liking to fit into small spaces, the human pet house is also made in just the right size for people. And when you’re not using it, you can fold it up compactly and store it for next time. The inside is made from raised nap and is soft to touch. The outside is made from smooth boa. Both the outside and inside are soft on the skin. The walls are approximately 3cm thick and filled with cotton and absorb surrounding sound and light well. 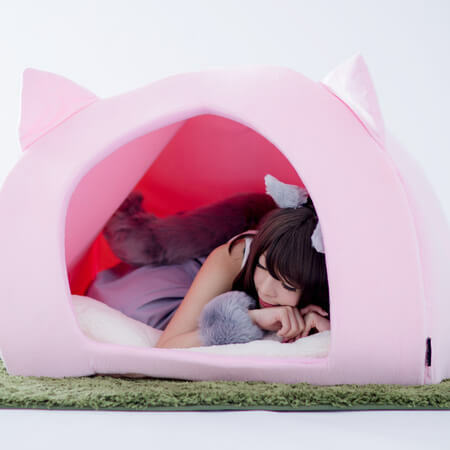 So you can relax comfortably just like a cat! 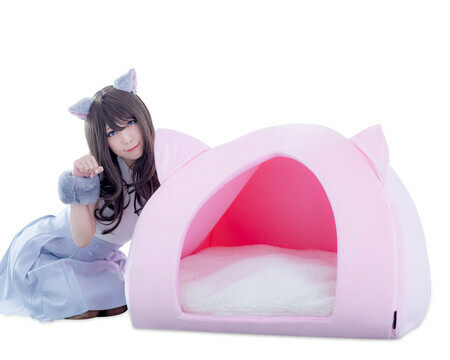 Get your paws on Bibi Lab’s® new human-sized pet house and relax like a cat to your heart’s content.